Individual weekly Take-Home papers coordinate with the Bible story. Inside is a picture that goes along with the Bible story for the children to color and a character-training story on the back about two kittens, Mitten and Boots. 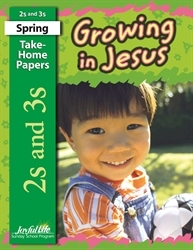 Parents can use thses papers to reinforce at home what was taught in Sunday school.